We’d love your help. Let us know what’s wrong with this preview of Pixels and Place by Kate O'Neill. 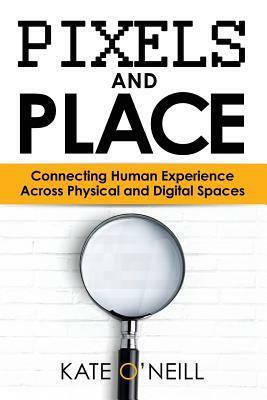 The distinction between “online” and “offline,” between “digital” and “physical,” once seemingly unambiguous, has begun to blur thanks to the ubiquity of smartphones and personal location data, ad and experience targeting, connected devices, wearable technology, the Internet of Things, and additive capabilities like 3-D printing. The biggest business opportunities for inno The distinction between “online” and “offline,” between “digital” and “physical,” once seemingly unambiguous, has begun to blur thanks to the ubiquity of smartphones and personal location data, ad and experience targeting, connected devices, wearable technology, the Internet of Things, and additive capabilities like 3-D printing. The biggest business opportunities for innovative experiences, according to digital marketing expert and "tech humanist" Kate O'Neill, will come from blending the physical and digital worlds intentionally to create a meaningful and integrated human experience. And to do that, we must recognize that human motivations connect these worlds through a transactional data layer, and create experiences with respect for the humanity represented by that data. To ask other readers questions about Pixels and Place, please sign up. Kate O’Neill is an author, keynote speaker, executive consultant, and "tech humanist." She is founder and CEO of KO Insights, which helps clients align their strategic approach to experience design and data to benefit both the organization and the people who use their products and services. Her prior roles include owning and running digital strategy and analytics firm [meta]marketer, creating the f Kate O’Neill is an author, keynote speaker, executive consultant, and "tech humanist." She is founder and CEO of KO Insights, which helps clients align their strategic approach to experience design and data to benefit both the organization and the people who use their products and services. Her prior roles include owning and running digital strategy and analytics firm [meta]marketer, creating the first content management role at Netflix, developing Toshiba America’s first intranet, and holding leadership positions in a variety of digital content and technology start-ups. She writes regularly for a variety of publications, and is the author of an upcoming book on human-centric digital transformation. Kate has been featured in CNN Money, TIME, Forbes, USA Today, and other national media, and has been named “Technology Entrepreneur of the Year,” “Social Media Strategist of the Year,” a “Power Leader in Technology” and a “Woman of Influence,” along with numerous other awards and recognitions.